This is an attempt t0 understand the meaning of goddess worship in our time. Written in simple narrative style, it takes us through Shakta imagery, philosophy, beliefs, customs, history, folklore and myth. 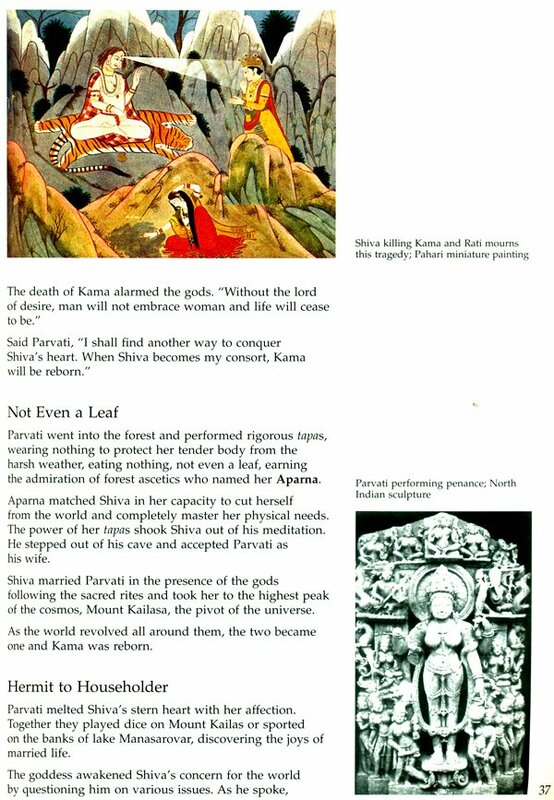 The book reaches to young and old alike, bringing together tales of Adi-Maya-Shakti, Lakshmi, Saraswati, Parvati, Kali, Durga as well as several village-goddesses such as Kanyakumari, Vaishnav-devi, Bahucharmata and heroines such as Anasuya, Arundhati and Savitri. Also included are tales of ancient goddesses who were once worshipped in other parts of the world such as Isis, Ishtar, Aphrodite and Diana. Highlights include lucid explanations and a pictorial key to numerous symbols associated with Shakta customs and Tantrik rituals, a map showing important Devi temples, a bibliography for those interested in learning more and over 150 illustrations of which many are in colour. Let me meditate on the supreme goddess who is existence itself, who sits on the lotus, who rides the tiger, who plays the lute, whose divine form dazzles gods, demons and humans, whose womb contains Time and Space, who embodies cosmic energy, who holds in her hands the implements of life and the instruments of death, who spins the cycle of existence as she creates and destroys all that is, was and will be and who empowers and enriches her devotee with the ability to accept and appreciate the unfathomable universe. Dr. Devdutt Pattanaik graduated in medicine from Mumbai University and chose to go into the field of medical communication and health journalism aimed at preventing ailments through health education and awareness. Though a medical man by profession, he is a mythologist by passion. He topped Mumbai University’s course on Comparative Mythology and is now part of ‘Sabrang’, a cultural organisation that aims to demystify the arts. Through lectures, workshops, articles in journals and newspapers, illustrations and books, he is determined to keep alive the ancient heritage of sacred lore and bring out its relevance to modern times. Dr. Pattanaik’s books, "Shiva - an Introduction" and "Vishnu - an Introduction" were published by Vakils, Feffer and Simons Pvt. Ltd. 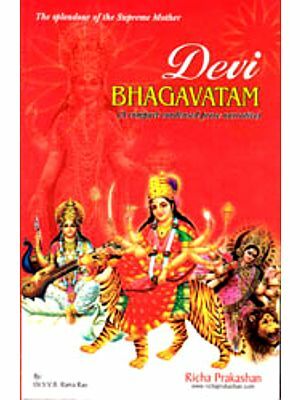 In this, his third complete book based on his mythological studies, he has tried to assimilate the various strands - mythology, sociology, philosophy - that have gone in the making of the goddess of the Hindu pantheon into her present day acceptance as an object of devout worship and a symbol of sublime art. Neither, say some religions. Male, say most. Female, say quite a few. Hinduism makes room for all these beliefs. Sacred texts state that the divine principle is both nirguna, without form, and saguna, with form. As nirguna, the divine principle stands beyond the confines of gender. As saguna, God can be masculine or feminine. Hence the Shakta cult of the mother-goddess Devi is as important to the Hindu as the worship of Shiva and Vishnu. Hinduism is one of the few surviving religions where the divine principle is adored in female form. No worship is complete without acknowledging Devi. However, though aspects of the same divine principle, the way the Hindu devotee approaches Shiva and Vishnu is quite different from the way he approaches Devi. This is clear from the offerings made to the three deities. The devotee offers Shiva uncooked vegetables and fruits and unprocessed milk. Such an offering befits the ascetic-god, who lives away from society on barren mountain tops. Vishnu receives rich buttery food flavoured with jaggery, since he is the householder-god, in revels in and ensures the wellbeing of the world. Offerings to Devi are quite different and varied. In temples where she stands as the demure consort - Gauri beside Shiva and Lakshmi beside Vishnu - she receives the same offering as her husband. But in Devi temples, where the goddess stands alone as Durga or Kali, the sacrifice of male animals such as fowls, rams and buffaloes are or were fairly common. Where blood sacrifices are frowned upon, symbolic sacrifices are made using pumpkins, gourds and coconuts. The goddess, especially her malevolent forms, is also offered sour and pungent foodstuffs like lemons and chillies. Another significant feature is that the goddess is often given clothes, cosmetics and jewellery. Such offerings of adornments are rarely made to a male deity. 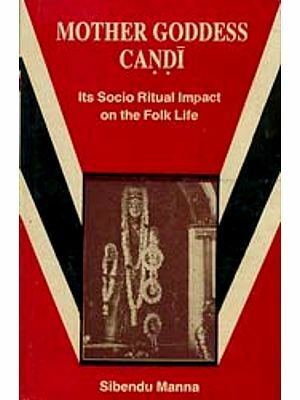 This book explores these differences in rituals through imagery and narrative tradition. Pictures and stories of Hindu gods and goddesses reflect how Hindus perceive life. In images, Shiva is either the formless linger or the ash-smeared ascetic; in stories, he is the reluctant groom who the gods have to coax into marriage. In images, Vishnu is the charming god who bedecks himself with flowers, sandal paste and gold; in stories, he battles demons, charms damsels and ensures harmony of the 1vorlcl-order by upholding cosmic law or dharma. Shiva clearly embodies the world-renouncing principle of life while Vishnu embodies the world-affirming principle of life. Devi is the world Shiva seeks to renounce and Vishnu is duty-bound to protect. It is she who makes Shiva the householder; it is she who bestows responsibility upon Vishnu and provides him with the means to fulfill that responsibility. Hence, she is identified as Shakti or energy that Brahma uses to create the world, Prakriti or Nature whose order is maintained by Vishnu, Maya or alluring delusion that Shiva seeks to break free from. The world that is Devi can enchant or overwhelm us. When the devotee offers the goddess blood sacrifice, he is acknowledging her power to create life by destroying life. When he offers her sour and pungent food, he acknowledges the totality of her divine personality - the pleasant as well as the forbidding, the beneficial as well as the harmful. Through the offering of bridal finery, he ritually makes known his desire to see only her kind and maternal side. 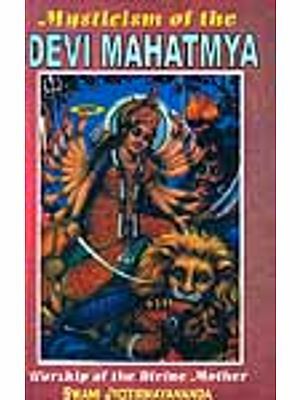 The aim of this book is to bring together the tales associated with the myriad manifestations of Devi, weaving through it Shakta philosophy and Hindu worldviews. It discusses rituals, beliefs and customs that express Shakta culture and the relationship between goddess worship and woman’s position in society. 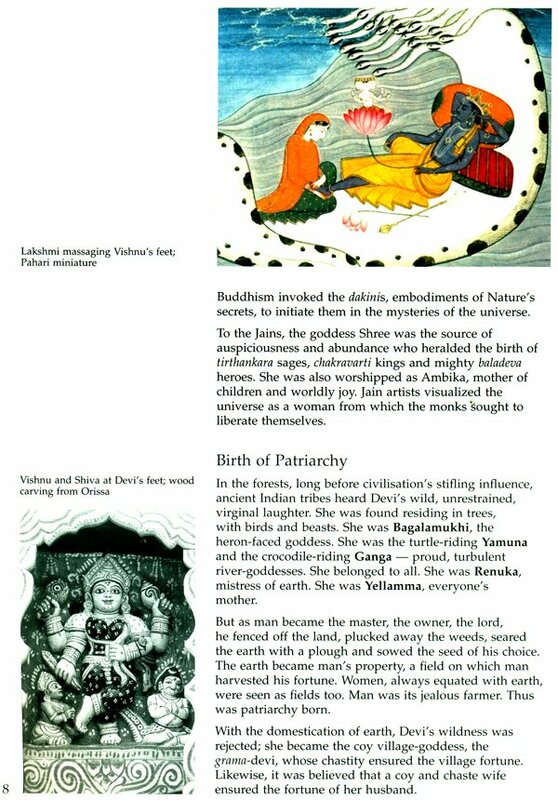 Also included is a chapter on mother-goddesses in foreign lands. Despite a vast amount of research that has gone into obtaining the information and images compiled in this book, this book remains ultimately just an introduction, not an in-depth study of the Shakta tales and traditions. For those interested in a deeper understanding of the subject, there is a bibliography at the end of the book. I hope and pray that my book successfully brings to light the games gods play to amuse and uplift man. And may it appease the almighty goddess.